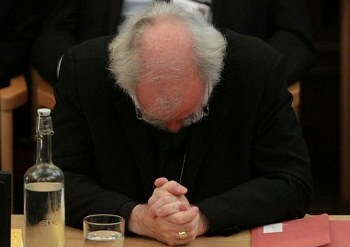 Church Of England Rejects Female Bishops: Can Truth Be Had By Vote? The Church of England put to a vote whether to include females as bishops last week. Females are already ordained in that organization (and by some reports will soon comprise a majority of priests), but none can be promoted past platoon leader; hence the vote. Excluding a few not-very-brave abstentions, the House of Bishops voted 44-3 (94%) for, the House of Clergy 148-45 (77%), and the House of Laity 132-74 (64%; vote details here). Since the measure had to pass by two-third vote in each House, it fell because of 6 votes in the House of Laity. It is to be emphasized, a majority in each House was found in support. You probably agree with me that anybody who would use gender as a gerund deserves any pain which comes her way. But it obviously false that God, or even “nature”, created “men and women equal.” The two parts of this species are equal in dignity, worth, value, but not in any physical or operational sense2. Even Goodman, after rejecting this truth, goes on to embrace it by asking “women’s gifts” be recognized3. Point is that since men and women are different, it is an open question whether in any particular area women or men (or neither) are better suited, and whether men should be excluded or women should (or neither). The Church of England has put in place rules to decide how questions like this are to be sorted out. These rules (of this voluntary organization) were agreed and adhered to, which is why the reaction to the vote is odd. Many critics complained the vote was decided by a “backward-looking” minority—this unadorned phrase was meant as an argument, understand. The tacit premise missing is that old beliefs, being old, are wrong, with the implication that whatever new “experiment in living” is proposed is at least worth trying. Both are fallacies, and silly ones, too. That they are held so strongly and used so frequently is a symptom of deep illness. Nevertheless: Forward! Skip past where Cameron employs the tiresome “backward” fallacy, to the point where he contradicts himself about the validity of the vote, where he threatens the C of E with Parliamentary action while claiming respect for the Church’s rules. You cannot have it both ways: either voting is right, and its outcomes thus to be respected, or certain matters are beyond voting. The latter view is the correct one. Voting only works where a group (or a large majority in the group) hold to certain base values (which are not voted upon), and where the questions before the group cannot be deduced with any certainty from those shared values. Once the group fractures such that separate blocs are opposed on the fundamental values, then voting cannot be trusted as a reliable guide to action. It is at this point where schisms and exoduses occur. 1I can’t speak for Canada or New Zealand, nor even for Mauritius or Lithuania for that matter, but I can report no bewilderment from this corner of America. 2It is always depressing to have to point this out, because it shows how far from rationality we have slipped. 3On the main roles of the C of E, Goodman says this: “how to bind fractured communities; address alienation and the inexorable rise of consumerism and how to protect the natural environment.” It will take a sharp mind to identify what is missing. 4The same English words in America often have different meanings in Britain, hence the quotes. I’m always puzzled by the types of jobs and positions that women agitate for. By my personal observation, the street sweepers and bin men in New York City are 100% male, and I hear no hue and cry of women demanding to be let into their ranks. So Cameron is fully in his right to tell the Church what to do. â€œGod had surely created men and women equal” was as far as I got. Over the years I have enjoyed many years of seeing people dictating to the divine how to best organize creation, but even they must see the folly of using it for purposes of constructing an argument. It’s even worse than that. Men are vastly over represented in the penal and mental instutions in this country. Men are 90% of the prison population. I think we need quotas for women so they will obtain their fair share of these positions. Advocacy for the UN Millennium Development Goals? Cameron is no more a conservative than I am a poached egg. As I understand it, the CofE folks did not decide to change their rules. Therefore there is no measure for parliament to act upon. All that happens is that the status quo continues. Do they need the approval of Caesar to do nothing as well as to do something? Apparently. Looks a bit like the Catholic Church, where the Pope can tell people what to believe and what not. But why is this weird? Europe had other State Churches, where the government had considerable influence in the Church, and vice versa. And when the Catholic Church was much younger it tried to get a hold on the State, and there were plenty of attempts of States to get a hold on The Church too. For State Churches it was very convenient to be the State Church: the State paid all expenses, they could use the State’s power to force people to pretend to believe the doctrines of the State Church, that kind of stuff. Worked very well at the time. Nowadays in Europe the majority of people believe somethig different than what churches teach. State Churches now find that being subject to Ceasar does have its disadvantages too. Things like that happen. But, anybody is free to start an new Church which isn’t a State Church. You can believe exactly the same thing, only, you have to pay for them yourselves. What is the problem with the Church of England deciding doctrine by voting? All the decisions of the early councils that established the fundamental tenets of Christianity were decided by majority vote. The Pope is elected by the Cardinals. Hopefully, all of this is done under the inspiration of the Holy Spirit. As an aside, the Pope cannot unilaterally tell Catholics what to believe. The Papal Infallibility doctrine presumes agreement with the Bishops. Anyway, it is has only been invoked twice with respect to Mary’s Immaculate Conception and her Assumption, and both of these doctrines had already achieved wide assent among the Bishops. The CofE is shrinking in size & influence in the UK. So, a minor religion, with a dying following. Few are particularly bothered by whether or not female bishops are permitted. Good question. Voting cannot decide truth, but can decide actions in the face of uncertainty. So much we agree on. But don’t forget the condition: those voting must share fundamental beliefs. It is when they do not that trouble arises. Safe to say that the College of Cardinals etc. agree on fundamentals. Good survey. Did you notice the large percentage of individuals listing themselves as “Jedi” or “Jedi Knights”? At least people in the UK still have a sense of humor. What’s all the fuss about a church group voting to decide matters of religious doctrine? The Council of Nicea did just that to decide that — about the very nature of Jesus no less. He came & went…and despite the first-hand observations & experience of his Church founders, and numerous witnesses, both before & after crucifiction, it turns out that nobody had him figured out (at least not with any official certainty). Then the debates began regarding his very nature (Arianism, Docetisism, etc., pure spirit, divine being in human form, mere human “possessed” by a diety, etc.). This led to a whole bunch of contradictory viewpoints of a most fundamental matter. Ultimately, the answer was got by voting–some 300+ years after the fact–and the answer determened was and remains merely a modern version of the Capitoline Triad (or Archaic Triad, the earlier variant of that theme in those parts where this religion & voting occurred). But why did that even have to come about? To simplify, but not quite too much: Because a guy named Marcion did an assessment and concluded that the jealous, vindictive & highly punitive God of the Old Testament couldn’t possibly be the loving, forgiving, turn-the-other-cheek God of the New Testament…and he formally complied Paul’s (mostly) and a version of Luke into a formal, bounded doctrine (what’s now considered a form of Gnosticism). That got a lot of followers–enough to pose a threat to the viability of the then new faith. The Church (then there was only one) had to respond with its own official record and Nicea’s results-by-vote are one of many such examples of how the official doctrine evolved as they had to address various kinks in the still-developing story. Church history is really interesting–for those truly interested in truth…the WHOLE truth, that is. Origen is an interesting case in point on how what was considered “just right” at one time later became heretical…and has since seen a recent resumption toward acceptibility. Why interesting? Origen was a renowned early Church “father” and later, posthumously (some 200 years after his death! ), excommunicated for heresay. Because he, like Paul (author if the letters & epistles now in the N.T.) make many lengthy analytical/philosophical analyses to reach conclusions–many of which are precisely those they could have simply quoted Jesus…assuming they’d actually read/heard of His lessons…which by the substitution of philosophising over mere acceptance of & quoting [of Jesus’ own words] suggests they hadn’t in fact heard of those specific teachings. I.E., why develop a rationale for a doctrine when God Himself provided the answer? Makes no sense at all…unless God’s answer still hadn’t gotten around. Considering that Origen lived from the 180s to the 250s A.D., that is delay is curious. SO, WHY NOT VOTE? The whole development of official Church doctrine appears, when viewed in-toto, much like a bunch of students working on a group story for a class project, or a bunch of sci-fi writers working on a TV series, kind of making it up as they go along & occassionaly resorting to logical gymnastics to extricate themselves out of the corner du-jour they’ve “painted” themselves into. Expecially since Justin Martyr (100-165), bluntly noted in one of his Apologies that the basic storyline of Christianity was part & parcel fundamentally no different than a pastiche of major elements of preceding pagan religions–a similarity so profound that rather conceding the copycat approach in which most then-Romans held the new religion, J. Martyr argued (around 150 A.D.) that Satan, knowing what was to come, simply concocted those false pagan religions to confuse humanity so it would be less capable of recognizing and accepting the true religion when it finally made its arrival (why this truth was kept from humanity for so long, thousand+ years of recorded history and why it was then disseminated so slowly…and why the fundamental story took 300-400 years to work out, or some 200+ years to work out after J. Martyr cleared up a most obvious objection, have never been really explained). At least, that’s how it appears when one, truly interested in “truth,” examines ALL the evidence in context and in relation to the other evidence: a) A religion that was kept hidden by evil demon(s) trying to obscure it by concocting–in advance–religions that would made the true religion look like a copycat, or, b) its a copycat religion (and, at that, just one more in a long more or less unbroken string of such). Given that the “true” religion is composed of a doctrine developed by multiple votes (doctrine-by-vote officially happened more than once!) its kind of hard to believe that…..
Is that picture of the Archbish, or Father Jack Hackett from “Father Ted”? Should I admit that I have a DVD of that show, or would that be too embarrassing? Of course, that was the problem with Lilith. Given that she was made from the same clay as Adam, she demanded equality and refused to submit to him. She was supplanted by the more compliant Eve rendered from Adam’s rib. More relevant, perhaps, “In any sexually reproducing species, equality of individuals [let alone between male and female] is a natural impossibility.” Robert Ardrey “The Social Contract”, 1970. Actually, it reads to me exactly the opposite. The people have told the hierarchy what they believe, and it is not what the elite wanted to hear. Briggs, the fact that you have a Father Ted DVD raises the already high esteem in which I hold you. Of course. But in a State Church the people of the Church have less say in the matter than the people of the State. England is a democracy, so all the English people are the State, and therefore the majority is in its right to tell the minority what to believe. Even if they do not believe themselves. That is the problem with State Churches. They only work if the State believes what the Sate Church teaches. Solution: start your own Church, which is not a State Church, and tell the majority to sod off. The wedding ring might be a clue here, unless the Vatican has different rules for Ireland….. Following the passage of the Church of England Assembly (Powers) Act 1919, there are two kinds of legal instrument. Canons are the internal rules of the Church that do not require changes in Statute law. They are passed by the Synod and assented to by the crown in its role of Supreme Governor. Measures are changes to Canon Law that require an alteration to statute law. Measures are approved in Synod then perused by a Parliamentary joint committee which may reject but not amend the proposed measure.Once approved the measure receives royal assent from the Crown in its role of Sovereign.So in the absence of a measure issuing from the Synod, the Parliamentary committee has nothing to approve or reject. Case 1 get on with it, Case 2 don’t get on with it, Case 3 attempt to clarify the position, check translations try to make a case for 1 or 2. If unresolved settle by discussion and vote. Now as Dr Briggs has observed many in the CoE leadership appear to be media figures with a sideline in religious worship and they don’t seem to share the same view of the churches function as the laity. That’s before we start to consider the “Highs” the “Lows” the “incense swingers” and the “evangelicals”….. Hence it isn’t certain that such a vote is the rational conclusion of a theological discussion rather than one more battle in an ongoing multi-way faction fight. The “Jedi” was an internet campaign, to be recognised on the UK Census, there needs to be a certain minimum number of “Believers” to get a religion officially recognised. By law, households have to complete their Census forms & return them, so it was also a way of sticking a couple of fingers up to Government! Now, as to the current version of the Bible, as various finds have shown (Dead Sea Scrolls etc), the bits that go into the current Bible were the bits that the compilers liked and in the 5th Century, having women telling men what to do, wasn’t on the agenda! I am sure you are right, but this has become politics. Might even become important politics. The State is only interested in Theology when it suits their purposes, and with a State Church they have influence.